Todays 90% pure or 21.6k gold price per gram is $36.91 This price is current and the page updates every 30 minutes with the most recent gold price (just hit refresh or F5). Bookmark and share this page then come back whenever you need to know the price of 1g of 90% pure gold jewelry, coin, or scrap. Note 21.6 karat gold is 90 percent gold with the other 10 percent being a metal alloy of insignificant intrinsic value. 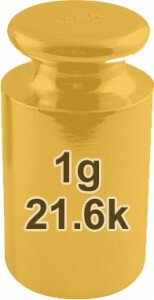 21.6k is a strange karat, but it makes sense when you look at the percentage. There are many items however that are 90% gold.